Indisputably, the past decade has been a golden age of tennis, but the era’s glitter stuck to only an elite gang of four. From June 2005 until this past January, all but one Grand Slam tournament was won by someone named Federer, Murray, Djokovic, or Nadal. Wawrinka always hung in there, even occasionally beating the top seeds, although to casual fans he was known as the second-best player in Switzerland. His friend Roger Federer is considered by many to be the best player ever. Wawrinka agrees. He has told anyone who will listen that he isn’t bothered by playing in the great one’s shadow. After all, Federer’s not just some dude – he’s a buddy, a supporter, and an occasional doubles partner. He and Wawrinka joined together in 2008 to win a gold medal at the Beijing Olympics. Wawrinka is an underdog’s underdog – reserved off-court but a wunderkind when holding a racquet, with all the modern accoutrements: big serve, outstanding fitness, and a balletic, one-handed backhand that may be the finest in the game. But for all his skill and precision, he simply didn’t win big matches. Worse, he never looked as if he thought he should. Until he did, in January, when he won the Australian Open. At 15, he devoted himself to the game full-time. He’s been on the circuit for about a decade, occasionally winning smaller tournaments or making inroads at the majors, eventually losing to one of the top players. Commentators praised his dramatic shot-making, his decorum, his foot speed. Yet for a decade Wawrinka remained one of the guys who might win a major one day. Wawrinka avenged his 2013 Australian Open loss to Djokovic by winning the 2016 U.S. Open. He had a point. As of March, the average age of the top 10 players was 27½. Contemporary tennis has become an older man’s game, and the elders, like elderly people anywhere, aren’t going to budge easily from comfortable seats. That year, Wawrinka would go on to play four ATP finals, finishing in the top 10 for the first season in his career. His first tournament of 2014 was the Australian, where he beat an injured Nadal, but just making the final was a feat. By beating Djokovic and Nadal on his way to the trophy, he became the first player since 1993 to eliminate the top two seeds at a Grand Slam. I brought this up in the car. Wawrinka merely smiled modestly. His left forearm is covered with a tattoo, a quote in script, from Samuel Beckett, the playwright who wrote so well about despair, it makes sense that he was also an avid tennis player: ever tried. ever failed. no matter. try again. fail again. fail better. He got the tattoo shortly after that loss to Djokovic, but it was already in the works: “I love tattoos. I don’t know if I’m going to get more, but I love them.” He showed me another, on his right torso, a drawing of his daughter’s hands. So I asked: Surely the Beckett tattoo related to his tennis at that time? He shook his head. He paused, thinking about it. “You need to be sure before you get a tattoo. When I’d found [the quote], and I was sure, I just did it.” But he agreed it pretty much summarizes the tennis player’s life. 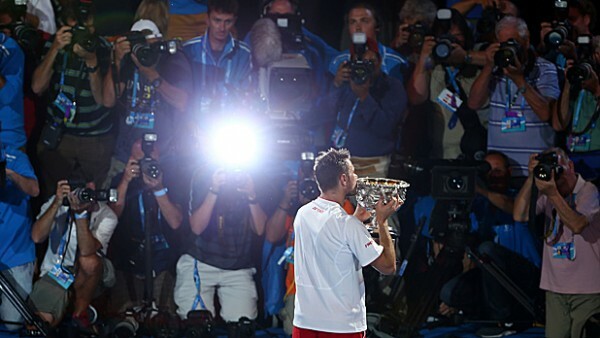 Wawrinka enjoys his first Grand Slam win. After Miami came Monaco, where Wawrinka reached the finals, and across the net was a familiar opponent: Roger Federer, who’d beaten him in their last 11 matches. But that was a different player back then – one lacking a champion’s validation. In Monaco, it was Roger’s turn to lose. Wawrinka clinched the match, 4–6, 7–6, 6–2, failing the best way he now knew how.